French Emblems: Emblem: prodosetairos exosus. Et quid conveniat, quid noceatque videt. Donec corripiat, perdat & omne genus. Auxit, quàm natae consceleratus amor? Tot curis tandem fessa, potita fuit? Omnia postponit, spretus ubique iacet. Quem cuperet nunquam se genuisse parens? Blind love never sees what decent motives say, nor what is helpful and harmful, but races to destruction and is carried onwards until it seizes the fate, hapless and joyless, that awaits it, and destroys the whole race. What stole power from Nisus, and enriched the realms of Minos, than the sinful love of a daughter? What did the sinful creature obtain to her profit; what did she get from her Cretan love, wan with so many cares? For the man who helps the enemy of his fatherland, or prefers libido to everything else, lies sunk in disgrace in every land. With what hope does the traitor console the fearful enemy, than that he should hope never to be a parent? 1. 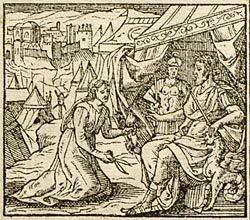 The story of Scylla of Megara, daughter of King Nisus: she fell in love with the invader, Minos of Crete, and cut off her father’s supernatural hair to prove her love. She was changed into a seabird, and chased away by her father. Ovid, Metamorphoses, Book 8.